650 Poydras was designed by Smallwood, Reynolds, Stewart and Stewart design firm. An exterior skin of ribbed precast panels with gray tinted insulating glass, clad the concrete-frame structure. The building is bounded by Poydras street, St. Charles, Camp and North streets. 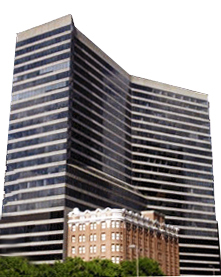 The Poydras Street side of the building provides a landscaped 8,300 square foot plaza at the building's base. A 20-foot-high colonnade on the south side of the building, facing Lafayette Square, offers a sheltered esplanade for pedestrians.. The high-rise office building features a 20' x 90' polished red granite lobby. Immaculately displayed is a 19-foot sculpture titled "Twin Ripples," designed by New York artist William Crovello as well as the stunning rendition of “Fat Tuesday”, a 10 foot commissioned painting depicting the joy and pageantry of The Mardi Gras, designed by Lynne Murray Gleason. Built in 1983, there is approximately 7,500 Square feet of retail space on the lobby level as well as a three-story-high terrace on the 11th floor overlooking the square. With 27 floors in total, the first eight levels of the structure provide parking for 450 cars and the remaining 18 stories provide 450,000-SF of leasable office space.